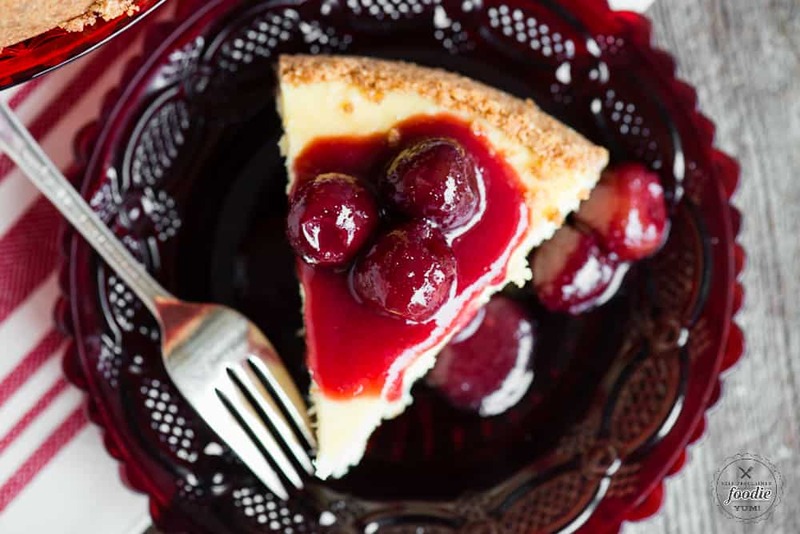 Granny’s Homemade Cheesecake with a sweet cherry topping is a super rich classic step-by-step dessert recipe that turns out perfectly every time. A tender graham cracker crust is topped with a dense, rich, creamy, and perfectly sweet cheesecake filling. Serve as is or make a quick show stopping bing cherry topping to add great color and intense flavor! 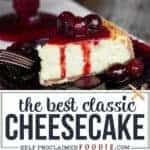 Granny’s Homemade Cheesecake is the absolute best New York style cheesecake recipe made from scratch that you will find. The texture of the cheesecake is super creamy yet dense enough to hold together well. 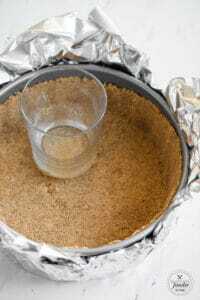 The graham cracker crust is super simple to make and yields the perfect amount. The cherry topping is totally optional, but worth every calorie! You will find a ton of different cheesecake recipes out there. 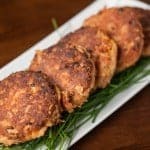 Some are “cheat” recipes that use part mix. Some will be homemade recipes that use ingredients like sour cream or cottage cheese in addition to the cream cheese. If you see a recipe for New York cheesecake that doesn’t include all four of these ingredients, the recipe you’re looking at is not a true reflection of the original NY cheesecake made famous by Lindy’s and Junior’s Deli. 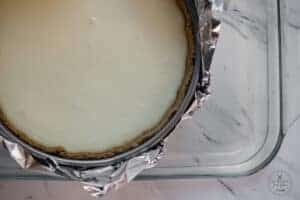 The only way my cheesecake deviates from the original is that I made my cheesecake in a 9″ spring form pan, where as the original NY cheesecake is typically made in a 5″ or 6″ spring form pan. Do you put flour in cheesecake? Cheesecake does need some kind of thickener and I have seen cheesecake recipes that call for flour. For this particular homemade NY cheesecake recipe, however, I chose to use corn starch as the thickener. The corn starch gets mixed with salt, vanilla extract, heavy cream and lemon juice before it is mixed into the cream cheese mixture. Why is cheesecake called cheesecake? Okay. I totally assumed cheesecake was called cheesecake because it’s main ingredient is cream cheese. End of story. Turns out there’s an entire history behind this epic decadent dessert! According to cheesecake.com, the original cheesecake didn’t originate in a deli in New York. It started in ancient Greece over 4000 years ago. Their idea of cheesecake was quite a bit different than the recipe we know and love today. The original cheesecake recipe used the simple ingredients of flour, wheat, honey and cheese that were formed into a cake and baked. Sort of similar to this cheesecake recipe, but not really. Ever make cheesecake and find yourself asking “Why is my cheesecake lumpy?”. Been there. Done that. Trust me – I’ve had plenty of failed cheesecake attempts in my day. The trick to an ultra smooth, opposite-of-lumpy cheesecake lies within the cream cheese. Be sure to use full fat cream cheese. The regular stuff. Do not buy the low fat cream cheese. Not for this cheesecake recipe. Not for your bagel. Gross. The cream cheese must be softened before you whip it. 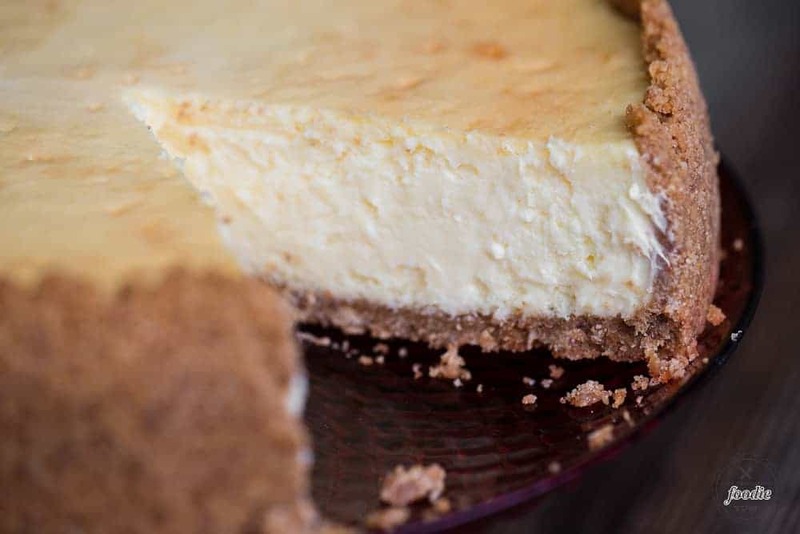 Whether that means you set it out for at least an hour before whipping it, or you gently warm it in the microwave in order to soften it, cold cream cheese will create lumps in your cheesecake. Whip it. Whip it good. Scrape. Repeat. 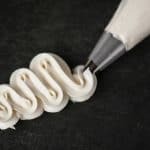 I cannot stress how important it is to whip your cream cheese to a smooth consistency. The whipped cream cheese will stick to your bowl, even after you add the sugar, so be sure to scrape the entire bowl as well as the paddle attachment or beaters multiple times. 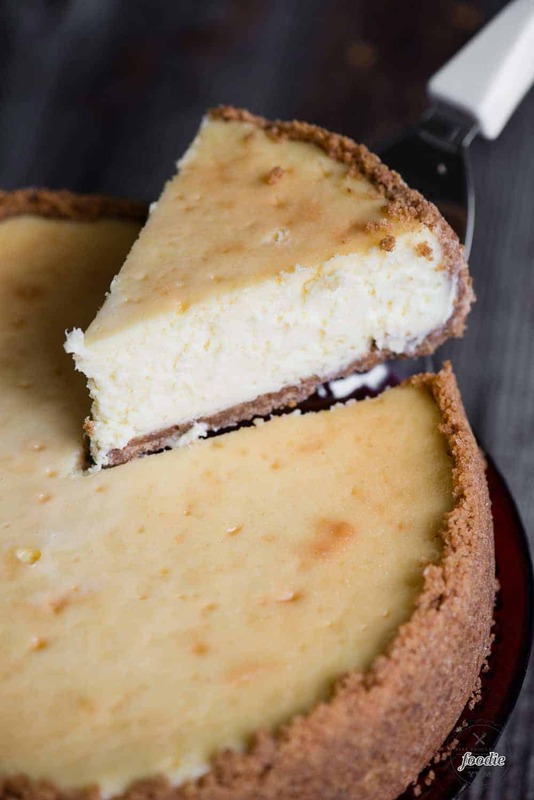 How do you make this classic NY cheesecake recipe? Not gonna lie. 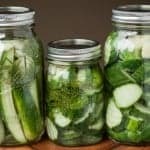 This recipe takes some time, special kitchen tools, a little technique, and a fair amount of time. Is it worth it? Heck yes. Any any cheesecake lover who’s lucky enough to get a slice of your homemade cheesecake will thank you too! I’m sure you can buy graham cracker crumbs, but I just buy graham crackers and run them through the food processor until they’re a fine crumb. Combine those with melted butter and sugar. It will look like sand from the beach. Dump that crumb mixture into a spring form pan. The bottom of a glass is the perfect tool to flatten out the bottom of the crust as well as push it up the sides. The butter will leak out of the pan, so you need to loosely wrap aluminum foil around the bottom. Bake the crust by itself for about 8-9 minutes. Like I said above, mix the cream cheese mixture really well. You really can’t over mix the cream cheese with the sugar. Then you’ll stir in the eggs. You want this to be fully combined, but once those eggs are in, take care not to over mix. You’ll add in the heavy cream mixture that has the corn starch, salt, vanilla and lemon juice. Once all of that is mixed together, pour it into the crust and bake. 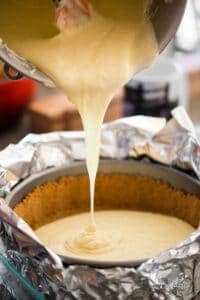 What is the best way to bake a homemade cheesecake? Start off with a very high heat and then reduce the oven temperature without opening the oven door. 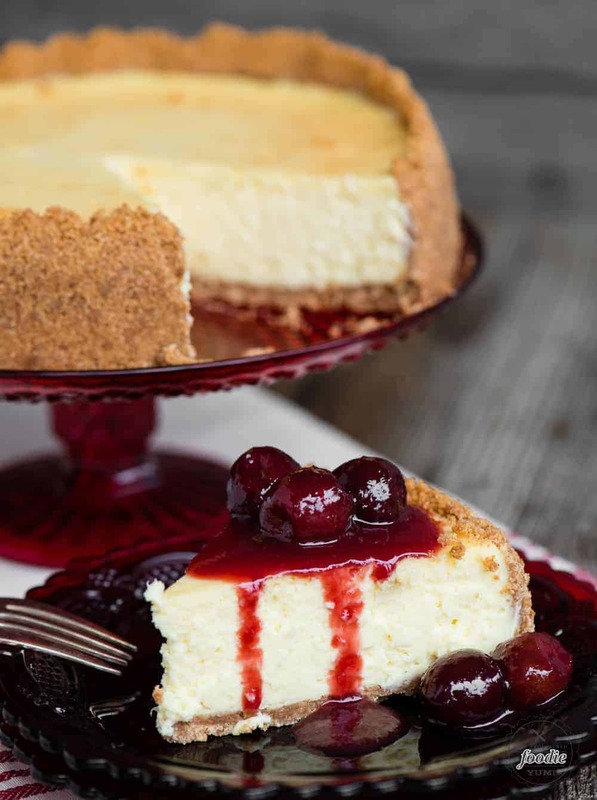 The high heat is important because it helps the cheesecake set but then the temperature is dropped to cook the entire cheesecake consistently. You don’t want to open the oven door because you’ll loose all of your heat and don’t want the oven ramping back up. Resist the temptation to open the door and peek! Cheesecakes need moisture to prevent cracking, so a water bath is the ultimate solution. I use the large baking dish I make my Texas Sheet Cake in and fill it with about 3/4″ water. The aluminum foil covered spring form pan fits in that bath. The added moisture in the oven along with the consistent temperature of the bottom of the pan prevents the cracking. What goes good on cheesecake? 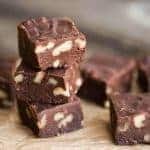 I included a recipe for an easy cherry topping that I quickly threw together with some frozen bing cherries I had on hand. You can always enjoy a slice of plain cheesecake, but you also won’t run out of options when it comes to toppings! Fresh fruit: You just can’t go wrong with cheesecake with fresh fruit. Strawberries would be my fruit of choice, especially if they’re as red and delicious as they were when I made my homemade strawberry shortcake recipe (you gotta check that recipe out). Other fresh fruit options that would work well are bluberries, raspberries, sliced peaches, etc. Chocolate sauce: A little drizzle of chocolate always makes it better. Caramel sauce: Ever make your own salted caramel sauce? You should. It would take this cheesecake to the next level. Homemade preserves: I make strawberry rhubarb jam every year and can it in a water bath so I can enjoy all year long. It doesn’t get much better than a slice of homemade NY cheesecake with some homemade strawberry rhubarb jam on top! 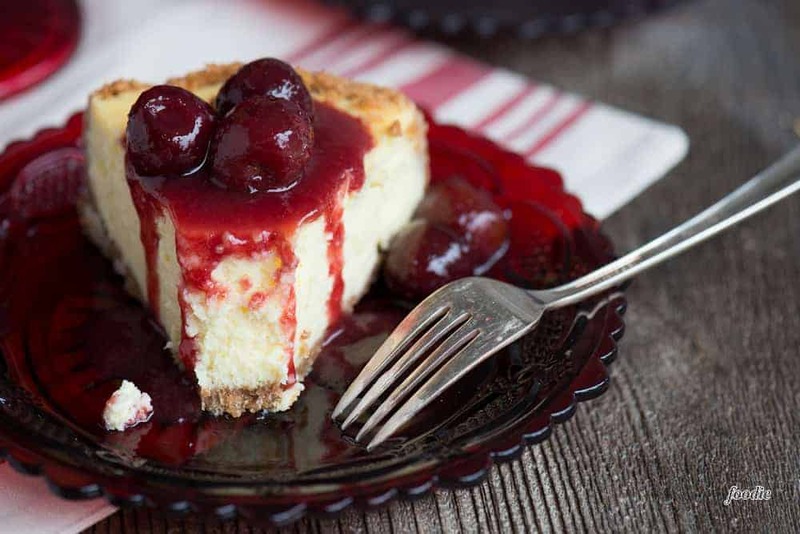 Granny's Homemade Cheesecake with a sweet cherry topping is a super rich classic step-by-step dessert recipe that turns out perfectly every time. Prepare 9" spring form pan by lining bottom with a 9 inch parchment round. 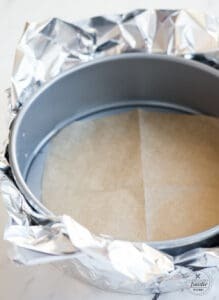 Use two sheets of heavy duty aluminum foil to line the bottom of your spring form pan. 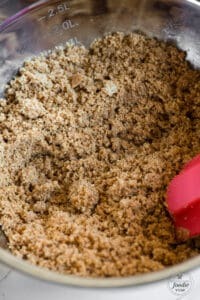 To make the graham cracker crumbs, pulse in food processor until you only see fine crumbs, about 1 minute. Thoroughly combine crumbs with sugar and melted butter. Use the bottom of a glass to press an even layer firmly into bottom of pan. Preheat oven to 350°F. Bake for 8-9 minutes until golden brown. Allow to cool completely on a wire rack. Meanwhile, prepare the filling. Add the sugar and cream mixture until well combined. Scrape again and be sure to scrape entire bowl to release any cream cheese that is stuck. Add whole eggs and egg yolks. Mix until combined. Scrape bowl again to release everything that is sticking. In a separate bowl mix cornstarch, salt, vanilla extract, heavy cream and lemon juice. Stir very well to get any and all cornstarch lumps out. Combine well with the cream cheese mixture. Maintain oven temperature of 350 degrees F. Pour cheesecake batter onto crust in the parchment lined spring form pan. Set foil lined pan on baking sheet or large casserole dish and fill baking sheet with enough water so that it is about 3/4 inch deep. This water bath will help prevent cracking. Bake at 350 degrees F for 10 minutes. Without opening the oven door, reduce heat to 275 degrees F and bake and additional 90 minutes or so until the top starts to turn golden brown. The edges should be set and the center should be slightly jiggly but not liquid. Turn off oven, open the oven door to let in cold air, and leave the cheesecake in the oven for 60 minutes. This will help prevent the cake from cracking and the cake will remain creamy. 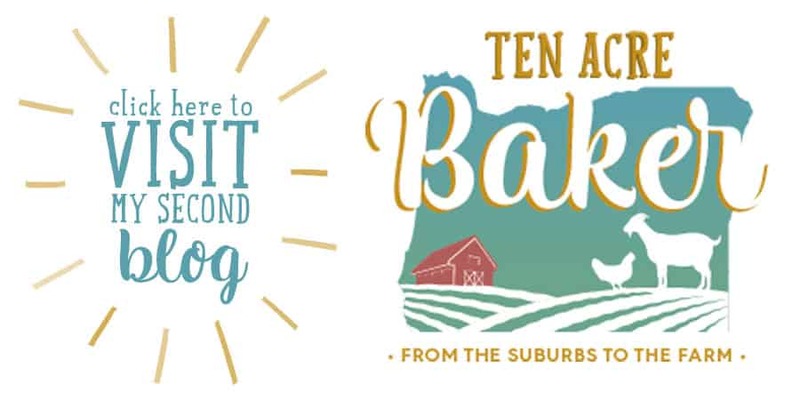 Transfer the cake to a wire rack and allow it to cool to room temperature. Cover the cake with plastic wrap and chill at least 12 hours or overnight before removing from spring form pan. Combine cherries and sugar in small sauce pan and heat over medium heat. Remove some of the whole cherries and set aside, if desired, or they can all go into the sauce. Cook until slightly thickened while stirring, about 10-15 minutes. Blend sauce until smooth in blender or with immersion blender in pan. Press through fine mesh strainer to create a super smooth sauce and discard solids (or feed them to your chickens like I did). Add reserved whole cherries back into sauce. Allow sauce to fully cool before serving. Be sure to have all cheesecake ingredients at room temperature prior to mixing. Oooh I will definitely trade calories for that cherry topping! 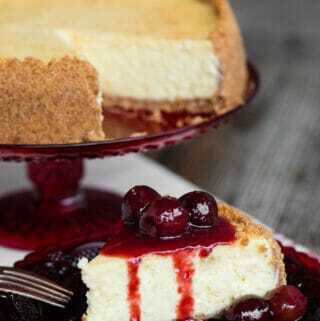 What a stunning cheesecake, can’t wait to try my hand at it!